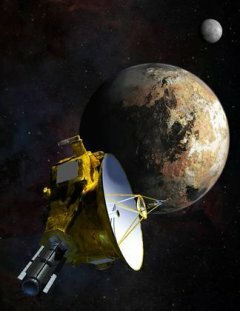 “We have waited a long time for this,” said CU-Boulder physics Professor Mihaly Horanyi of the Laboratory for Atmospheric and Space Physics (LASP) and a New Horizons co-investigator. The SDC is the only one of the seven instruments aboard New Horizons that has been collecting data since launch. From 2002 to 2005 Horanyi shepherded a revolving group of about 20 students as they developed the dust counter, which is helping researchers learn more about the origin and evolution of our solar system and the formation of planets from dusty disks around other stars. An illustration of the New Horizons spacecraft at Pluto is available at here.